The machine is composed of a screw mounted Body on electrowelded base supporting two main driving rolls, vulcanized high endurance special rubber cast and rectified, plus two more soft free and position adjustable rolls for the tape application on curved surfaces. The driving roll station is in bridge form construction.Machine is used for applying the self-adhesive protection tape or film on aluminium extruded profiles in their length on both sides. When an aluminium profile is covered in its full length, its feeding stops automatically and is continuing only after the next aluminium profile is presented to the driving rolls. The machine is suitable for applying adhesive tape on two faces simultaneously and also curved surfaces of aluminium extrusions. Protective adhesive film is applied simultaneously on the upper and lower face of the Aluminium sections. Part of these faces can be curved in shape. Motor: 380 V, 3 phases, 50 HZ, 1/2 HP. Start/Stop Button on 24 Volts. Maximum Width of Profile's Section: 250 mm. 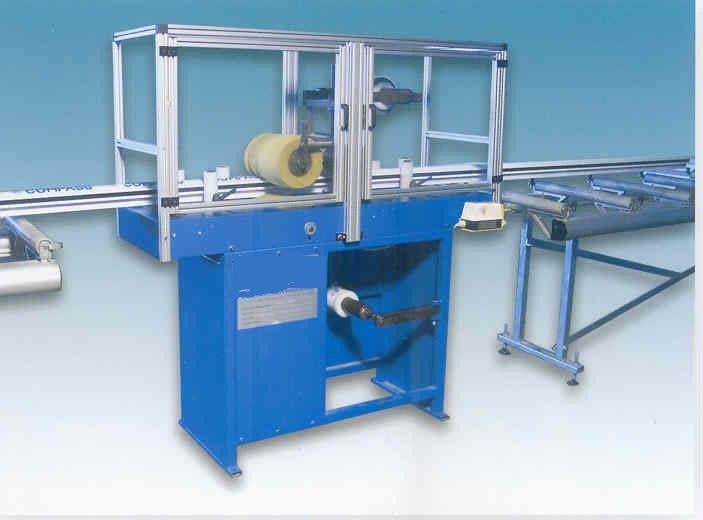 Automatic Machine for Applying Self Adhesive Film Tape onto aluminium extrusions. Machine for Applying Self Adhesive Film Tape onto aluminium & other metal sheets. PS: We also supply cutting machine to slice longer rolls of protective tape into desired width.